Robert Frost was asked to deliver a poem at the inauguration of John F. Kennedy. He describes the history of America from the time of being only a colony of England. He said it was America because we owned the land but in the beginning were tied to England. He reminded us that the lessons of the land taught us to go back to our beliefs in freedom. 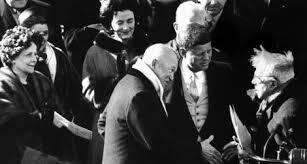 Kennedy ask Frost to change the last line from “Such as she would become” to “Such as she will become”. The change reminds us of Kennedy and his optimism.